Earlier today, reputable KGI Securities analyst Ming-Chi Kuo said the iPhone 7 Plus will likely have a dual-lens camera system based on technology Apple acquired from LinX Imaging. The new hardware could lead to some significant improvements in camera quality on Apple's next flagship smartphone. LinX's multi-aperture cameras pack impressive image quality in a smaller size than single aperture cameras, meaning the iPhone 7 Plus may lack a protruding camera lens and be able to take SLR-quality photos — think Canon or Nikon. The camera modules are also capable of very interesting technology called 3D depth mapping and more. We previously provided an in-depth look at LinX's camera modules after Apple acquired the company, but it is worth recapping some of the major advantages of their technology, given today's iPhone 7 Plus rumor. The images captured by the LinX camera are brighter and clearer, with significantly reduced noise levels, compared to smartphone cameras. Available detail when zoomed into a photo was also much greater, as can be seen in the comparison below. View this PDF for more side-by-side image comparisons. In the photo below, the image was taken in mid-levels of light, at approximately 40 to 50 lux, similar to a decently well-lit room in a house or restaurant. The LinX sensor let in more light than the iPhone 5 or the Samsung Galaxy S4, for a photo that is clearer and sharper with less noise. LinX technology is able to significantly improve low light performance by using multiple channels to increase the sensitivity of the camera for better detail. It also keeps exposure times short to cut down on the motion blurring that can impact photo quality in conditions where lighting is not optimal. LinX technology doesn't have to compromise between pixel size and resolution, as it can use small pixels but still let in adequate amounts of light. 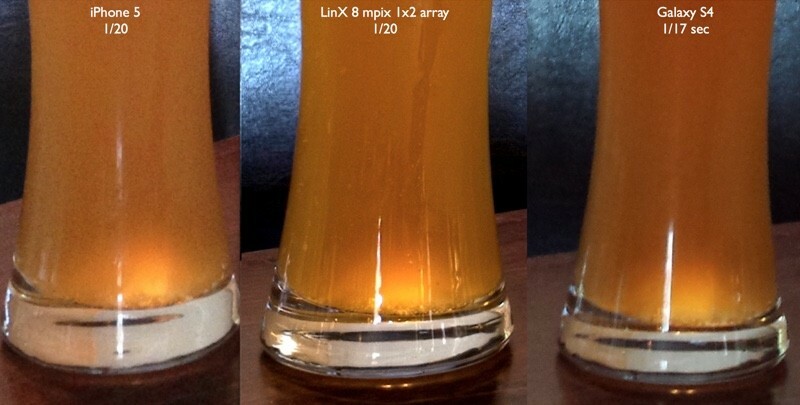 LinX's multi-aperture cameras can create detailed depth maps of objects. With depth information on a per-pixel basis along with RGB information, LinX cameras can create 3D point clouds of objects from a single frame or a complete 3D model by combining several frames captured from different angles. 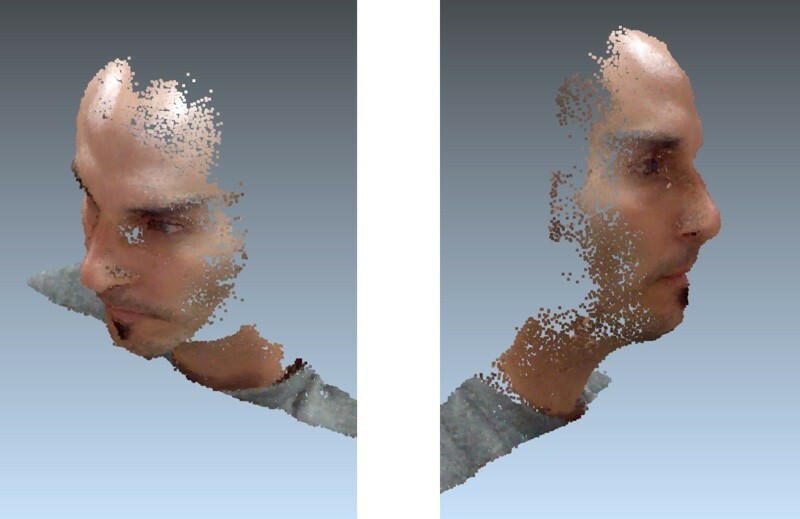 3D depth mapping has a number of useful applications, including 3D scanning of objects, sizing of objects, background removal and replacement and gesture recognition. The depth maps also allow for improved refocusing; by knowing the depth at every pixel, the feature allows for a synthetic blur to be applied that emulates a shallow depth. Read A Look at LinX Camera Technology for more details about the dual camera systems. That's some of the biggest PR bull ever and most of the media outlets chime right in. Why do I need to get a phone that's way too big for me in order to get the improved camera? So friggin annoying...why are they comparing to the 5s instead of the a new 6s. Probably because there is not much of a noticeable difference. Because these PDFs were made at the time when iPhone 5S was the newest model and right before Apple bought the company out. Since Apple bought the company, you can bet no further public information is allowed. And iPhone 6s is definitely worse than iPhone 5S in noise reduction quality IMO. Now if the laws of physics could enable us to have optical zoom the same as a 400mm lens on a phone, I'd be set. That some of the biggest PR bull ever and most of the media outlets chime right in. The best part is when the idiots who fall for that PR see my pictures (shot with a D90 from 2008) and ask me where I got them printed because they came out so much sharper than their iPhone prints. But then you have people in the photo forum here who insist their iPhone is as good as an SLR and show side-by-side pics under ideal lighting to prove it. When you suggest they try shooting in dimmer light or compare crops so you can really see sharpness at print resolution, they never seem to notice those posts. 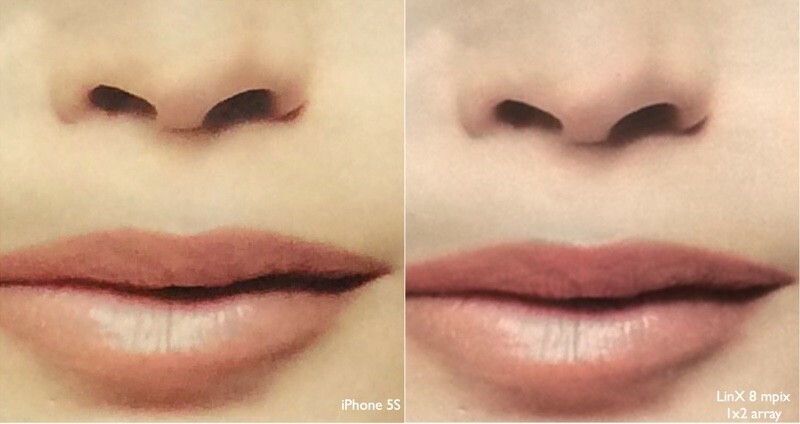 Noise reduction is a huge problem with the 6/6s cameras, something iPhone 5S is better at. The samples used here is on iPhone 5S as well, so that means the next iPhone camera with LinX features will be the biggest improvement in image quality in many years, assuming Apple didn't do anything else to mess it up. Great to see improvements in image quality, though SLR like.... Yeah, you cannot fool physics even with marketing lingo . As a photographer, I've found the strength of a photograph and its ability to connect with a viewer has very little to do with the camera that captured the image. Indeed, I have photos from my iPhone that are just as compelling as those from my other so-called "real" cameras. Good photographs come from a photographer's eye, imagination, life experiences, etc, and ability to compose what's in front of the lens, ultimately creating an image that releases narrative and stirs a viewer's mind.